In the world of international politics and intrigue, hot situations should not be left to hot heads. Politically minded ambassadors should not trust their affable but incompetent offspring to mind the embassy. Amateur spies from New Jersey should not bring their families when they photograph arsenals of newly formed totalitarian governments. And Machiavellian sadists running high on coup and caffeine should not head the secret police. But nothing is as it should be, and from a position of safety in the audience, we can’t help but greet this volatile situation with explosive laughter. Father Drobney (Tom Hicks): He's been hiding in the embassy for six years from 3,975,000 athiests. Ambassador Magee (David Reese): In a race for governor, he'll appeal to psychotic liberals and militant facists alike. Kilroy (George Kappes): The ambassador's assistant, knows the second stanza of The Star Spangled Banner. Axel Magee (Tony Nelson): The ambassador's son, accidentally wrapped his lunch in a peace treaty. Marion Hollander (Michele Shapero): The inexplicably level-headed and tolerant wife of Walter Hollander. Walter Hollander (David Vale): A cook, not a spy, he photographed a secret military arsenal. And got caught. Susan Hollander (Stephanie Brost): Engaged to be married, that's just her first problem. Krojack (Robert Carette): Head of the secret police. Wants to hang Walter. And most everyone else, as well. Burns (Trip Burns): An embassy assistant. Chef (Lee Prichard): Eccentric, temperamental, and vital. Sultan of Bashir (Duane Herriges): Important and insulted. Sultan's First Wife (Michelle Wiggins): Veiled and silent. Kasnar (Duane Herriges): A party guest. Countess Borodini (Lee Prichard): Another party guest. The positions without names are open. Let us know if you're interested. 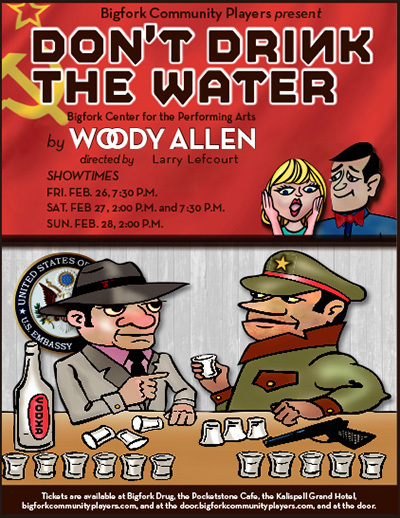 Friday, February 26, 7:30 p.m.
Saturday, February 27, 2:00 p.m. and 7:30 p.m.
Sunday, February 28, 2:00 p.m.